Yeah, but could Tom Hanks do this?! Most times I assume I know what will happen next in a comic book because I am arrogant. I think I know it all and have seen it all. Most every time I am wrong about where exactly the comic book is going or the writer's intentions lie, yet, I don't look at the data telling me to stop thinking I know everything. I just keep thinking I'm Cobra Kai. Well, today I will accept the evidence because today my comparison of a comic of the day to another fictional story was so right on that the writer himself admits it in the first scene of the comic. Last month I posted about Superior #1. I wrote about how similar the story was to the classic Tom Hanks movie, Big. 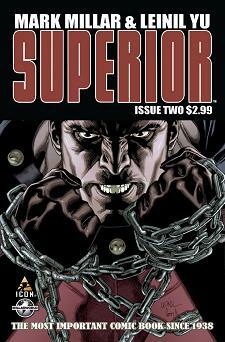 This month, I open Superior #2 and read Mark Millar's comparison of his tale to that of Big's. Yes! I got one! This doesn't happen often, and since it happened once I will forever be the greatest storyteller-database in the history of the world. Too far? Not far enough? Check out last month's post and be the judge. Also, you can look at the my comment on IGN's review page from October 14th...you may also see my comment where I gloat. Oh, on a side note about the actual issue, Superior #2: who the heck watches CSI on DVD? In a flash back panel, the father suggests watching episodes from the box set of CSI. Is that really a show you can't just catch on any channel in the world? It's like Law and Order. Do you need the seasons to understand any episode at any moment in time?